The 95th AMS Annual Meeting in Phoenix begins this weekend. Are you concerned that you won’t be able to keep track of everything going on at the meeting? Do you want to be certain that you don’t miss any presentations, exhibits, or special events? Are you looking for some help with organizing all of your plans for Phoenix? 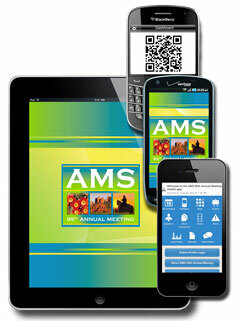 We have a solution for you: the AMS 2015 mobile app! On it you can find lists of exhibitors, sessions, Town Hall Meetings, and even individual authors making presentations. With the app, you can access helpful documents (including maps of the Phoenix Convention Center), keep up with social media activity, watch videos from the meeting, and get shopping, dining, and entertainment suggestions for the Phoenix area. There’s even a “locate me” feature in case you get lost in the convention center–which could be a common occurrence with so much going on! The app will also provide real-time alerts and information from the meeting’s organizers. And maybe best of all, it includes a personal scheduler that allows you to keep track of your day-to-day plans so that you don’t miss anything. You can do all of this with just a few clicks on your mobile device, whether it’s an iPhone or iPad, Android device, or Blackberry or Windows phone. And it’s free! So what are you waiting for? Download the app today by visiting this page (and get some tips for using the app here).